who works part time at the local quilt shop! You will occasionally find me here! 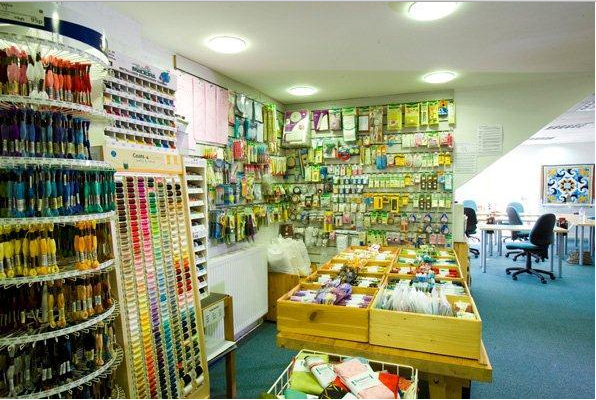 Patchfinders is a specialist quilt shop that has two floors filled with gorgeous fabric and everything that a quilter needs. 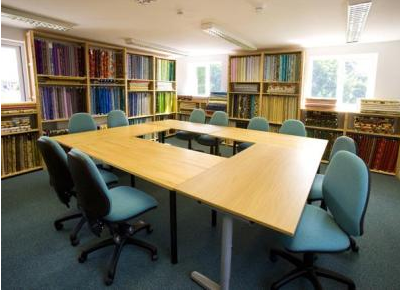 It also has a great teaching space where workshops are held and I hope to be able to teach some classes in the future. Upstairs there is more space that you can hire for just £3 per person per half day (£6 per day) and that includes tea and coffee. A fabulous place to come and work on your projects, alone or with friends! 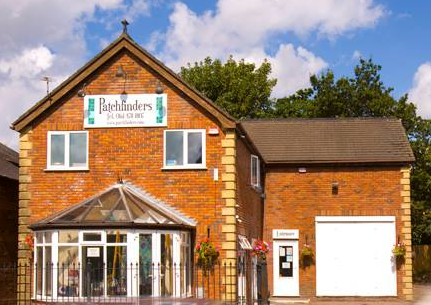 Patchfinders don't sell online but if you are in the Cheshire / Manchester area it is well worth a visit! And you can always call to place an order. Tomorrow is SALE DAY! So that's a good reason to come along! SALE DAY Saturday 29th March 15% off Everything!! Good for you. When I worked in a bookstore for 12 years, I always got asked if I spent my paycheck in the store, I bet you'll get the same question! Have fun. Jealous!! And so happy for you Lucy. Enjoy! That is SO great, I'm jealous! Pity I'm not in your area at all... Enjoy! I'm in Suffolk but have a friend who lives in Cheadle Hulme, she's started doing a bit of sewing so I'll tell her about it. How fun - looks like such a great shop! I'm sure you'll be spending your paycheck there now, LOL!! Excellent job! So happy for you and I do hope that you get a staff discount. Looks like a lovely shop. Oh, I hope this is just what you needed! It sounds like a good fit. But I'm with Rebecca Lynn - I'd never come home with a paycheck rather like when I worked for a scrapbook store years ago. I hope they are smart enough to hire you as a teacher soon. So happy for you! Fantastic Lucy! Congrats, it looks like a fabulous shop. Lucky you!!!!! This looks like such an amazing place too. Used to do that myself, great fun being able to play with fabric. Enjoy. Congratulations! Just liked them wish I could visit them! Hope you get teaching opportunities I know you will be great at it! And it is a lovely place, the staff were friendly and helpful before- they could not have acquired a better new member of staff! Well done you, and well done them! Congratulations on getting the perfect job to combine with your quilting! £3 for half a day is a very good price, and it's such a lovely big space. I know a shop near here that charges £5 and hour to work in a tiny space. It looks like a lovely place to work - have fun! Yay! Lucky girl! So jealous. I would love to work for my local quilt store, but an opportunity has never come up, and unfortunately it doesn't pay as well as my "real" job (teaching). Who looks after Lois for you when you're working? That was always the hardest part for me, getting childcare. Just no options in my little town.